I figured I'd change things up a little today. There is a famous person in this lineup. But who is it? You need not name them all to win. Only the famous one. That's all the help I can give you, Roger. Taking a wild guess here. Could it be a young Theodore Roosevelt. Good guess DAG, but TR is not in this photo. OK Nate, it was wild guess. I do have a back up wild guess. This could be stretch, how about Queen Victoria, elderly lady with flowers in her hair. Ah DAG, you're in the right time period, but alas, no Queen Victoria in this crowd. Is it John Jacob Astor in the chesterfield coat and hat? Look at the little boy with the sword. Adorable. Mary, thanks for your guess. Unfortunately, these are not Astors, but I agree that the boy is adorable - hint: it is not the boy with the sword. Oh, I see Mary got to have a process of elimination clue. Is it the dashing man in coat & Derby? Is that the Titanic? Judi, it is neither the dashing man in the coat and derby nor is this party on the Titanic, but thanks for guessing. In the words of Holmes, the game is still afoot. To much drama for me to even try to guess. The dapper looking gentleman in the back row is Sir Arthur Conan Doyle. ENM gave an excellent clue with "The game is still afoot"
Jan, wonderful guess, but unfortunately I was not trying to mislead with my "game afoot" comment. Sir Arthur Conan Doyle is not in this photo. So many faces, but who is the famous one? This person is instantly recognizable by name, but apparently not by appearance. Too much fun for me, so I'm extending the game until 6 pm Pacific time tonight. In case you missed it, the theme is "Cloak and Dagger." Good luck to you photo sleuths! Is the lady on the left Mata Hari? I didn't see the "cloak and dagger" theme before for some reason. Or...equally a stretch of the imagination...is the older lady with flowers in her hair Belle Boyd? Congratulations to Mary, who correctly identified the Mata Hari! Good work. After Judi's first comment I was afraid the contest was going to end quickly. Baffled as usual sir. Great contest this time Nate. I did take the time to study the photograph closely. The lady on the left did catch my eye. 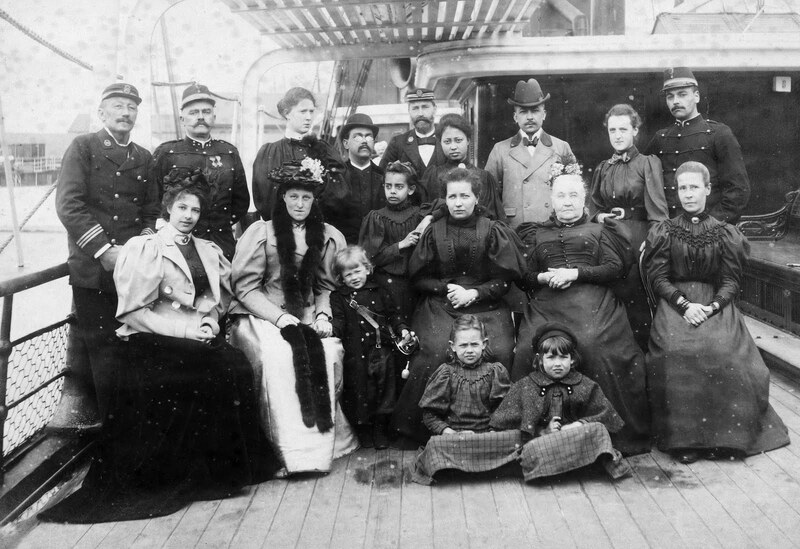 Toulouse Latrec, fourth from the left in the back. Great photo! I didn't realize these people were Dutch (the Indonesian people should have been a clue). Her real name was Grietje, which is still a common name in the Northern provinces.